MACS® GMP media have been developed for the demands of specific cell types, such as dendritic cells, T cells, or Treg cells. These high performance media enable excellent growth or differentiation, high cell viability, and consistency under serum-free conditions. 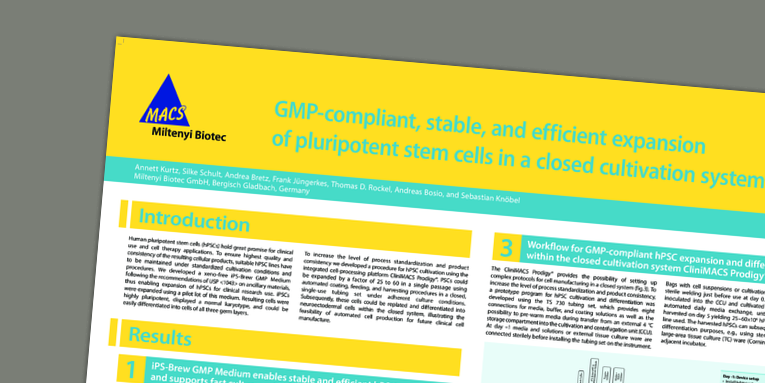 Filling in flexible bags allows seamless GMP manufacturing of cellular products. Customized formats are available on request. Highest product standards are ensured by quality control (QC) functionality tests on every batch and extensive documentation including certificates of analysis (CoA), product data sheets, and regulatory support document cross reference.